1. Holy cow! 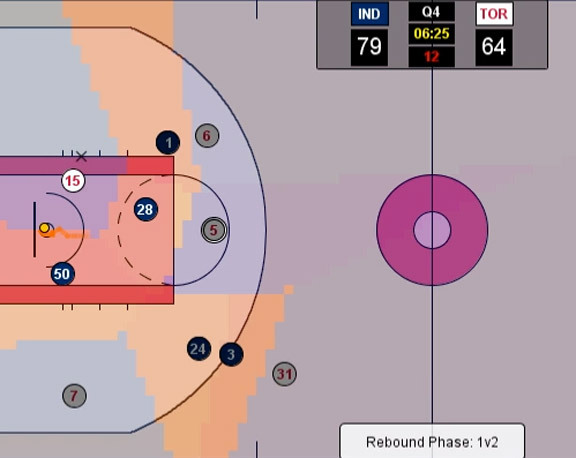 The Raptors are way ahead of (Insert Team X) in gleaning useful data from the SportVU camera systems. 2. If Toronto’s front office is so savvy, and so determined to combine traditional “eye test” analysis with the most advanced data available, why are they still a mediocre team? And why did they trade for Rudy Gay, an inefficient player whom a new, analytics-savvy front office in Memphis dumped within months of its ascension? That question in part gets at the simplistic cause-and-effect assumptions that infect too much NBA analysis: A team is smart; ergo, it should be good. Or: A team is dumb; ergo, it should be bad. The real NBA doesn’t work that way over short time spans, and it’s especially strange to argue that it would in connection with a piece of technology that’s practically brand-new. A bunch of key variables outside the smart-dumb continuum affect the success of an NBA team: geographic location, ownership, willingness to approach the luxury tax, injuries, and plain old luck. Yup, luck. R.C. Buford, Gregg Popovich, and Sam Presti are clearly three of the smartest basketball people alive, but the “models” upon which their long-term success is built collapse without a piece of insanely good lottery fortune at Step 1. They’d all happily concede the same. As for the proliferation of inefficient and overpaid players on Toronto’s roster — Gay, DeMar DeRozan, Andrea Bargnani, Landry Fields — it’s fair to question all of those signings and re-signings, all of which happened before Toronto had gotten this far along in the SportVU revolution. Front offices are not a monolith. It’s possible some within Toronto’s front office disagreed with general manager Bryan Colangelo when it came time to sign off on all these deals. And if you ask Colangelo about them, he’d probably cite a number of “traditional” variables that factored into each one — the desire for a star attraction (Gay), the team’s willingness to approach or pay the luxury tax, the time it put into developing a young player (DeRozan), the misguided signing of Fields to block New York’s pursuit of Steve Nash, and the goal of locking up a young asset in DeRozan at a tradable (if inflated) price — just as Denver did with JaVale McGee. The Gay trade was a calculated risk that probably won’t move the needle much, but it represented an understandable move from a team that doesn’t attract star free agents and needed to monetize both an expiring deal (Jose Calderon) and a non-core asset about to go up dramatically in price (Ed Davis). Gay’s next contract will be telling, though. They’re all questionable moves. But they don’t discredit the importance of analytics as a tool. • The natural follow-up question: If teams need a franchise player (duh) and use all sorts of “traditional” criteria in making decisions, does all this fancy stuff even matter? Does it make any difference? Of course it can, and it does. No smart person would dismiss any piece of information, which is why no NBA team is dismissing SportVU or analytics in general. Even the Knicks, long and justifiably derided as James Dolan’s brainless money pit, have invested in the cameras and hired well-qualified analytics people. On the simplest level, the cameras will give coaching staffs much better information in preparation for specific opponents. The Raptors, for instance, have tracked how teams defend the pick-and-roll over tens of thousands of those plays: Do they have the big man defending the screener blitz out at the ball handler, effectively trapping him? Or do they prefer to drop that big man back toward the foul line? Is there a middle ground? And do they like forcing pick-and-rolls left and/or toward the sideline? Toronto knows those answers, and even better, they know how effective teams are when they employ particular strategies. Miami, for instance, blitzes (or “shows”) on about 52 percent of pick-and-rolls — by far the highest percentage in the league. You probably could’ve guessed that, but it’s still good to know, and it’s interesting to think about the other 48 percent of pick-and-rolls. But did you know that Portland is no. 2 so far this season, dispatching a big man in some form on 45 percent of opponents’ pick-and-rolls? Or that most of the best pick-and-roll defenses lean toward a more aggressive style of play, pursuing opponents’ point guards a bit farther from the hoop than less successful teams? Boston and Oklahoma City are both around Portland’s territory in this department, and the data shows that Boston is especially stingy when its big-man defender takes an aggressive stance. “The best pick-and-roll defense teams hardly ever drop [their big man back],” says Raptors director of analytics Alex Rucker. The exceptions, according to the data: Chicago and San Antonio. • It might sound counterintuitive, but opponents of Boston and New York, respectively, have much more success generating points when they involve Kevin Garnett and Tyson Chandler directly in pick-and-roll plays by using their man as the screener, according to Toronto’s data. Why? Probably because doing so removes an elite defender from the back line, although there is still much to learn here. Wouldn’t you like to know this stuff? 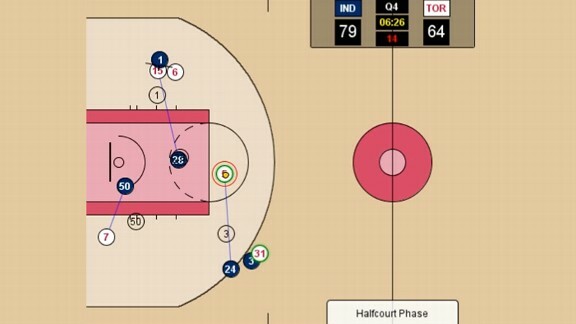 • The Raptors have also studied the flip side: How does Opponent X do on offense when defenses blitz the pick-and-roll? What happens to their points per possession when defenses drop back instead? • Most pick-and-rolls involving two wing players or guards — the Kevin Durant-Russell Westbrook or LeBron James-Dwyane Wade versions, for instance — are devastatingly effective, according to Toronto’s data. This is partly because teams are using them judiciously, Rucker says, reserving them for elite player combinations. Should teams perhaps broaden their use of this type of play, given its effectiveness around the NBA so far? This is a pretty common NBA action, with John Lucas III (No. 5 in white) running a pick-and-roll with Terrence Ross (No. 31) on the left side of the floor while Alan Anderson (No. 6) curls around two screens and comes out on the opposite side for a possible jumper. That’s Ian Mahinmi, No. 28, in the middle of the paint, and he’s done an almost perfect job mimicking his ghost in order to contain Lucas in an emergency; he’s abandoned his original mark (Amir Johnson, No. 15 in white) in order to wall off the paint. But look at Lance Stephenson (No. 1 in blue) and Ghost Lance behind him. The real Stephenson has continued along the path he’d normally take on this play, trailing Anderson wide around Johnson’s screen. But Ghost Lance has recognized that Mahinmi has called an audible and adjusted in kind — by cutting off his normal path, darting to the inside, and doing his best to contain the suddenly wide-open Johnson. The Raptors can actually measure this. See that little “X” right above Johnson’s No. 15? That’s the exact spot at which the ball will reach 9 feet in height after ricocheting off the rim, according to Toronto’s algorithms, which use the camera data to track speed of the ball, shot trajectory, and other variables to come up with that “X.” The different shadings correspond to areas of the court that individual players “control” when the rebound phase of a possession begins; that purple chunk of real estate belongs to Johnson, and the program can factor in Johnson’s length, height, and rebounding skills to determine the size of that chunk. League executives, especially on the 15 teams who’ve purchased the SportVU system from STATS, hope this kind of data can work to put a dollar figure on work ethic, defense, and other skills beyond scoring. Teams, including the Raptors and a group of academics who presented at the MIT Sloan Sports Analytics Conference, have also started looking at whether teams are too cautious in crashing the offensive glass, i.e., whether the gains in sending an extra guy to the boards outweigh the ground you might lose in transition defense. The MIT team recommended crashing more aggressively, and although the Raptors haven’t embraced that conclusion with quite the same gung-ho enthusiasm, they’re also leaning toward the idea that crashing the offensive glass more aggressively is a good thing — especially for teams with players capable of both chasing a rebound and retreating hard on transition defense on the same play. Among players who can do both very well, per Toronto’s data: Kevin Love and Amir Johnson. • A lot of people asked about Rucker’s assertion that a 28 percent 3-point shot is better than a 42 percent mid-range jumper. That statement obviously doesn’t necessarily apply universally; personnel, time in the game, scoring margin, and the shot clock are all important variables. But three is greater than two, and every study of rebounding has found 3’s also lead to a much higher number of offensive rebounds than mid-range shots. They might also lead to long rebounds and fast-breaks for opponents, but the evidence of damage there is less clear. • The Raptors have also started looking at which teams are best at using particular offensive plays to finish possessions. In other words, everyone runs a bunch of pick-and-rolls, but which teams most often gain an advantage via the pick-and-roll that actually leads to a shot — and not the resetting of the offense for some other action? Golden State, for instance, runs relatively few pick-and-rolls in raw terms, but a whopping 67 percent of those pick-and-rolls start a cascade of events that lead to the end of a possession — the highest “conversion” rate in the league. Brooklyn ranks at the bottom of that list, meaning Nets’ pick-and-rolls are more likely than those of any other team to go nowhere and lead to the resetting of the offense. That’s not necessarily a bad thing; Miami’s way down there, as well. But unlike the Nets, the Heat are ridiculously efficient on possessions where a pick-and-roll does lead to a conclusive event. This suggests that Miami is (a) just really good, and (b) smart about recognizing when a pick-and-roll hasn’t done enough, and something else, even another pick-and-roll, might yield something better, Rucker says. • Tony Parker runs 36 pick-and-rolls per 36 minutes, or one per minute. Shaun Livingston runs about 14 per 36 minutes. Just a fun fact. Both have been among the league’s 15 or 20 most efficient ball handlers, in terms of team points scored when they run a pick-and-roll, and that pick-and-roll leads to the end of a possession. • Here’s something interesting: Toronto’s analytics team believes isolations — those selfish and allegedly inefficient plays — might be very good things for some offenses, and the Raps’ current data suggests possessions that end via some event that results from an isolation are about as efficient as pick-and-rolls that do the same. This is where the SportVU data can go beyond something like Synergy, a stat-tracking tool every team uses. Isolations come out as very low-efficiency on Synergy, since Synergy measures only shots that come from the player isolating one-on-one. It doesn’t precisely measure what happens when that player draws help and kicks to a spot-up shooter, and when that spot-up shooter then drives, draws more help, and kicks to an even more open shooter who knocks down a 3. The Raptors are doing that, and they’ve found isolations in that larger sense are quite efficient — at least for teams with the right personnel. “They’re fabulous for us,” Rucker says. • The same is true of post-ups, which are low efficiency on their own, but much higher when you include shots that come via kick-out passes to open shooters and other trickle-down events — at least according to Toronto’s data. Post-ups are also more likely than other plays to lead to some end-of-possession event, and not to the resetting of the offense. • One of the very best isolation players in the league, by this metric, is Clippers guard Jamal Crawford. According to Toronto’s data, Crawford runs about 8.5 isolations per 36 minutes. The Clips have scored about 1.36 points per possession on those plays, which is so far above the average isolation number (about 1.02) as to be ridiculous. Interestingly, Crawford’s pick-and-rolls have been among the league’s least efficient. • The Raptors have filtered out garbage time, but they could also filter their numbers to include only garbage time, if they’re ever curious to learn the real garbage-time All-Stars. According to Toronto’s internal standards, the average NBA game contains just over 45 minutes of meaningful basketball, and 2.5 minutes or so of garbage time. • One more fun ghost video from a Pacers-Raptors game: Keep an eye on Kyle Lowry (No. 3 in white) and Ghost Lowry as Indiana swings the ball around. Real Lowry gambles for a steal, as real Lowry is prone to do, and Ghost Lowry frowns upon this risky behavior. Fun times. • I could go on. The point is that even though the sheer amount of data can be overwhelming, if a team has the right people looking at it in the right ways — a task that will literally take years — it is clearly helpful. It won’t rig the draft lottery, land a franchise player, and eliminate bad decisions and bad general managers; Michael Beasley will still be drawing a paycheck years from now. Data will never replace watching games and all the dirty work of scouting, and no sane person has ever argued it could. But it can help on the margins, and the margins are very important as the level of competition tightens. It can help a team unearth bargains, identify market inefficiencies, serve as the final nudge toward a decisive lineup change (e.g., the Mavericks’ decision to start J.J. Barea midway through the 2011 Finals), and guide a team toward players with specific skill sets it values highly because of the camera system. In other words, if you want players who defend like ghosts, find them and sign them, especially if the marketplace undervalues them. I think Ghost DeRozan is still available.